If you are looking for water pipes and hookahs in Virginia, check out the range we have here at Glass City Tobacco. There's nothing quite like the experience of enjoying your favorite tobacco from a water pipe or hookah. Stop by today to visit us! At Glass City Tobacco we strive to provide the up most outstanding customer service. All guests are treated with full respect and professionalism. We are here to assist you with your favorite products and would like the opportunity to educate you on your new soon to be favorite products. 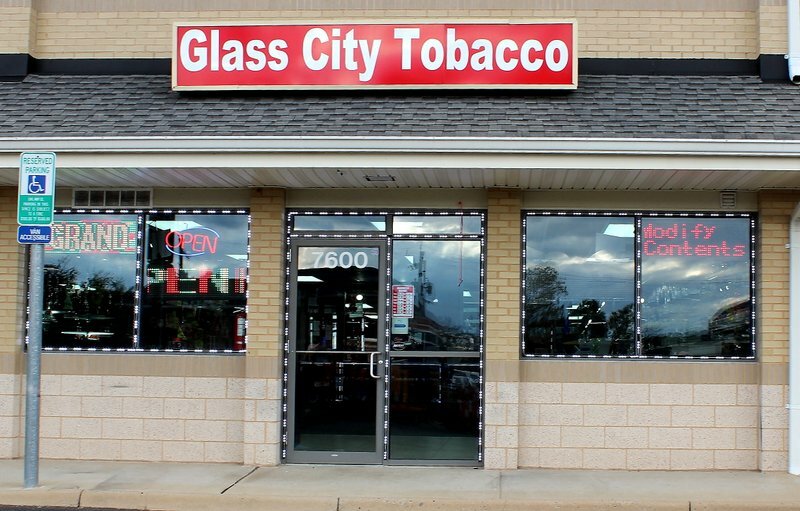 We want you to enjoy your experience at Glass City Tobacco. We encourage you to share your complaints as well as the praises. If you have any complaints, please let us know and we will remedy the situation immediately. If you are unable to find the product you desire while visiting our stores, please let our staff know and we will do our best to get it to get it for you. We accept Visa, Master card, American Express, and Discover credit cards. Shipping is currently unavailable through www.GlassCityTobacco.com. Please check back soon. All sales are final. Please ask sales clerk regarding certain product warranties. Q: Do you carry my favorite Cigar brands? Stop in for your favorites. Q: What is an E-Cigarette? A cigarette-shapped device containing a nicotine-based liquid tha tis vaporized and inhaled, used to simulate the experience of smoking tobacoo. Q: What is the difference between dry tobacco versus E-liquid? E-liquid : E- Liquid is the fluid that fuels the Electronic Cigarette. It is what provides the nicotine solution and the flavoring to your Electronic Cigarette. It is the vapor in which you exhale that mimics the traditional tobacco smoke. Dry Tobacco: Dried tobacco leaves are mainly smoked in cigarettes, cigars, pipe tobacco and flavored shisha tobacco. They are also consumed as snuff, chewing tobacco and dipping tobacco. Q: What is a Hookah and how do I setup my new Hookah? An oriental tobacco pipe with a long, flexible tube that draws the smoke through water contained in a bowl. 1. Place hookah stem into the glass vase. The fitting should be airtight. 2. Place the metal tray over the top of the hookah stem. 3. Insert hose end with hose gasket into hose port on hookah stem. 4. If your hookah model comes with an air release valve, unscrew it to make sure there is a ball bearing inside. Screw the valve back on. 5. Check the air flow on your hookah by putting your hand over the top of the hookah stem and sucking in with the hose. There should be little to no air intake. If your hookah model has a check valve, with your hand still on top of the hookah stem, blow through the hose. You should hear air expelled out through the check valve. 6. Remove the hookah stem from the vase and fill the vase with water. Put the hookah stem back on vase. The stem should be submerged about an inch into the water. 7. Break up the shisha tobacco as you gently lay it into the clay bowl. You will want to sprinkle it in so that it is loose enough for air to pass through. The shisha tobacco should be filled to the rim of the bowl, but no higher, as this will cause it to burn quickly. 8. If you are using a metal screen, place it on top of the bowl. If you are using foil, wrap the foil over the head so that it fits tightly. Make sure to poke holes into the foil so that air can pass through. The holes should not be too large as this too will cause the tobacco to burn quickly. 9. Place the clay bowl on top of the hookah stem with the bowl gasket in between the hookah stem and the bowl. The clay bowl should fit tightly. 10. Light your coals. If you have instant lighting coals, you can light them with a lighter or match. Other coals will need a stove or a torch. Wait for the coals to become red hot all over before placing them on top of your clay bowl. Be careful not to add too many coals as your smoke will become harsh. 11. Inhale on your hose. It may take a minute or two before the hookah is smoking properly. If you still need assistance after following these instructions feel free to stop by your local Glass City Tobacco store or contact us at (571) 261-9073. A device that generates a particular substance in the form of vapor, especially for medicinal inhalation and can be used for tobacco as well. Q: What is a Glass Pipe and how is it used? A Glass Pipe is a hand held smoking device which contains a bowl with a large hole on the left side, used to hold dry tobacco. To use a Glass Pipe, load the bow with a small amount of dry tobacco. Put your finger oveer the carb (the small hole on the side of the pipe) while lighting the tobacoo and inhaling, take your finger off the carb and continue to inhale until desired amount of smoke has been inhaled. Hold smoke in mouth for a few seconds and exhale. Q: Could I purchase an item without proper identification? Supplies and services are only provided to those over the age of 18 years old. We reserve the right to deny service to any party under the legal age of 18 years and will do so upon checking your driver’s license. Supplies will not be sold to anyone without proper photo identification, no exceptions. Q: Do you match competitor prices? No, we do not match competitor prices. We are confident that we provide the best material at the best prices.